Ahh... just sipping a nice glass of Bordeaux and thinking how Christmas is just about over. The decorations are coming down tomorrow, all the spiced apple candles are burnt out and I have had my last cup of tea out of a Christmas mug. We have had a great time but I will be glad to get back to normal. 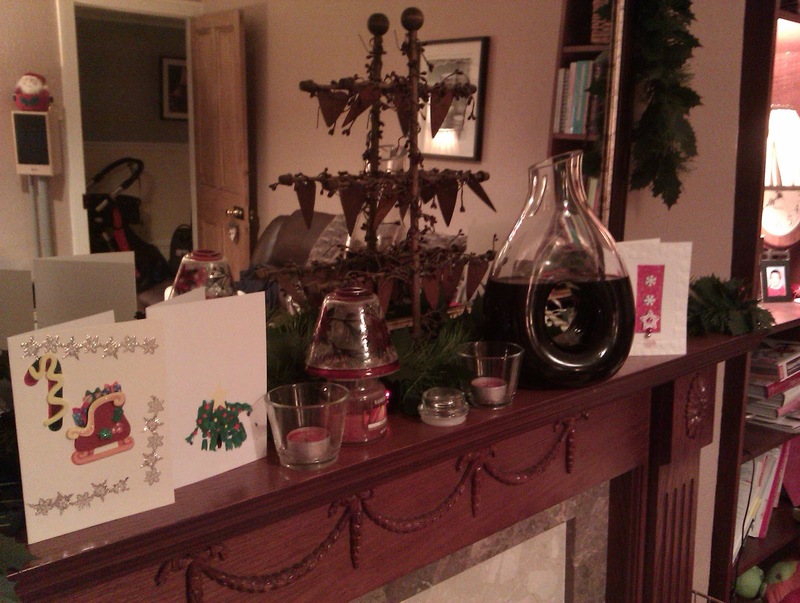 In the picture below you can just see the wine resting amongst Jussie's lovely homemade cards and Elodie's nursery card. The small candle-lamp was a Christmas yankee candle from our Becky. The holiday season kicked off with some of the worst weather I have ever known. Temperatures have been getting down to minus eight. Your face would be so stiff with cold after being outside for ten minutes that you couldn't speak properly. You really got a sense that if you got stuck outside you would be in real peril. Unfortunately, this meant that even a small trip to mum and dad's or walking the dog involved a major dressing up session. 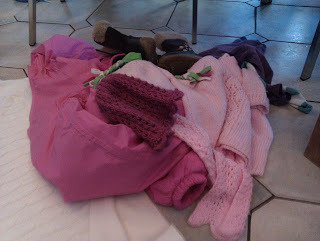 Here is a photo of the amount of clothing that the girls required- full smowsuits, scarves, hats, gloves, fur lined boots. Dressing up took twenty minutes by which time one of them had pooed, started crying or overheated leaving me struggling to get my hiking boots and gaiters on as quickly as possible. Thoroughly miserable, can't wait for sundress and flip flop season. Then, the snow came. 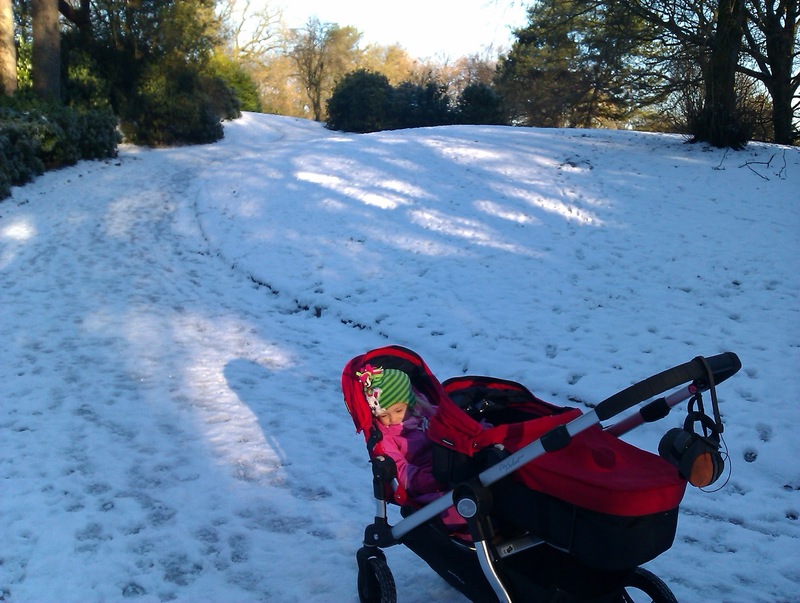 Initially, it was only a couple inches and the pram was great in the snow. Freya was very nervous about walking on the ice and snow- so from an independent toddler who could walk round the park she was demanding to ride in the buggy. As the snow got deeper, the wheels of the pram couldn't get through it and we became housebound because I couldn't manage the three of them without wheels. Poor Mooms, she had to content herself with playing in the garden. At least at the weekend we could go out with Freya's new sledge. I bought this particular sledge because it seemed more sturdy than the cheapo plastic ones that shatter. I still remember my brother returning from Chislehurst golf course with a small triangle of plastic on a string after borrowing either mine or Becky's sledge. Unfortunately for Craig, this new one has break handles that Freya pulls at throughout the ride. Freya is a bit of a daredevil and took to falling off the sledge really well. Her good mood in the snow was helped by the fact that she had a fleece lined snow suit and mini ski mitts- she was like toast. Despite having bought all the Christmas home magazines and being really inspired, Edie's arrival threw my Christmas preparations into a bit of a tailspin. 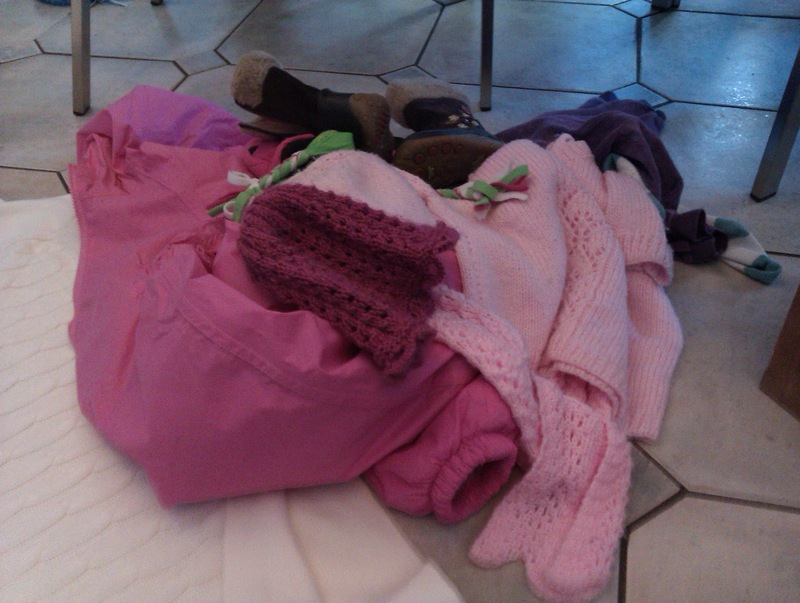 I am finding it hard to keep the house tidy, never mind shopping, cooking and decorating. Our Becky was coming to visit on the 18th of December so that actually gave me a bit of a push. 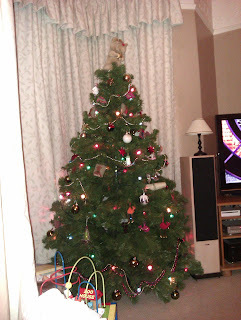 Craig and I decorated the Christmas tree and mantelpiece. I did a big internet shop for all the presents (no lovingly handcrafted gifts or carefully sourced presents this year) so the house was a bit more festive for her arrival. I got the Christmas mugs out to share a brew and some stollen when she arrived. Becky's visit did get me more in the mood. We watched 'The Family Stone' with glasses of Cava, did some cheap Christmas shopping in Darwen and got drunk on apple martinis whilst sat amongst piles of washing, toys and recycling in our breakfast room. The recipe for this lovely tipple is as follows: 3 measures vodka, 6 measures of apple juice, juice of half a lemon, 1 measure of sugar syrup and a glug of white wine. I was so sad to see her go back to Dundee, she had been a great help and great fun. Freya was delighted to have Bailey around and squealed "Bailey, get through!" all day long. We thought that Freya wouldn't really understand Christmas this year but she has pleasantly surprised us. With time being short we decided to only have one Christmas tree this year, our big artificial one. My love of interior design magazines had led me to having sophisticated trees in the past, beautiful white lights paired with gold and silver glass baubles. This year we wanted to go tacky/kitsch to enthrall Freya, seventies style coloured lights and every multi-coloured decoration we could find - 'more is more'. 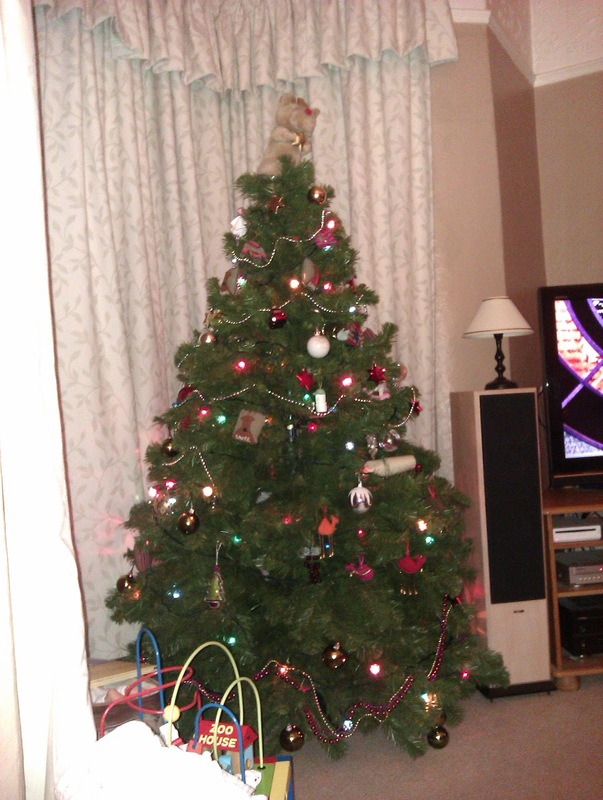 Our efforts were rewarded when Freya saw the tree and stood in awe and said to the tree "Thankyou, thankyou." I have caught her trying to hug the tree on a couple of occasions. We have had another family Christmas with both sets of parents joining us for Christmas day. Craig's mum and dad were flying back from Cuba on the 23rd to stay with us and mum and dad were going to join us for present opening at 10.30am. We were still scrabbling round cleaning, shopping and wrapping at 1.30am on Christmas day. It felt like when we got married and by the time the day rolled around I was so fed up with planning and organising that I felt 'what will be will be'. Ray had driven Craig mad by lying around and expecting to be waited on, stating " We love coming here because we don't have to do a thing" as Craig pushed past his outstretched arm with handfuls of presents. It finally dawned on us that Christmas is no longer about us.